There is a lot I could tell you about blending modes so I'm going to make my tutorials around that for now and keep each tutorial simple by just adding a couple of tidbits here and there. Another helpful blending mode I want to tell you about is hard light. I use hard light on shiny elements. You can find hard light in the same menu as overlay. 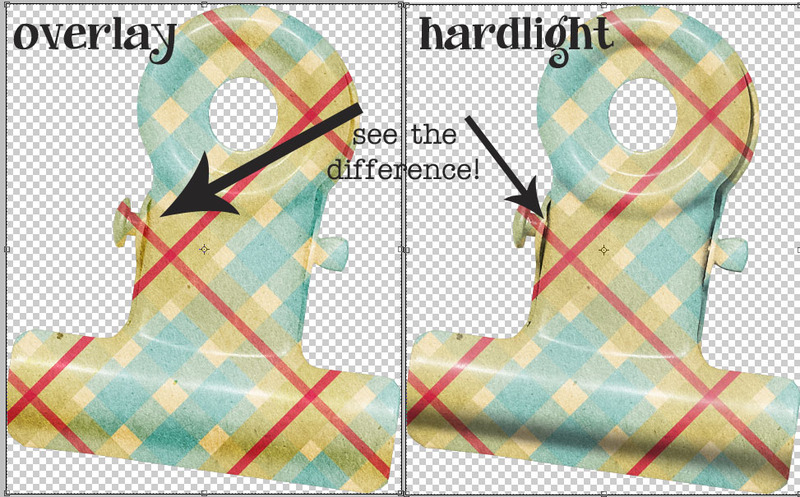 Below I have a side-by-side comparison of an element where I clipped a paper to a bullnose clip (from Rachel's Scraps) and then I duplicated the bull nose clip, de-saturated it (you know how to do that, right? grey scale a color element?) and then made it an overlay using hard light and then overlay so you could see the difference. Notice that with the overlay, the shadowy areas are not very shadowy (as you noticed from the blending mode on papers tutorial). Hard light does a great job of letting those shadows show through, giving more depth to the element. You might notice that the hardlight seems a little less bright. I would just merge all the elements and then boost the saturation on the whole element aftwerwards. Overall, the hard light was a more effective blend mode for this element. Other elements that hard light works well on are buttons, gems, shiny string and any other shiny elements that have a glare. 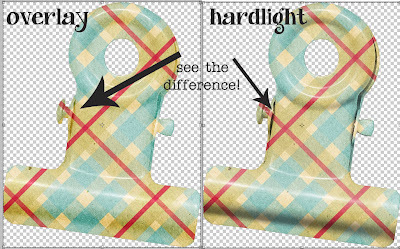 You will find that sometimes the overlay colors the hilights and it just doesn't look natural. One other thing about blending modes I wanted to bring up today is about clipping your overlay layers to the shapes. 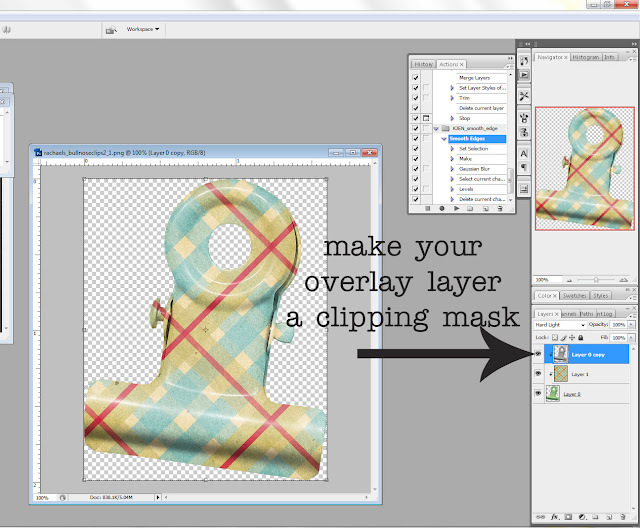 In the picture below, you will see the original clip layer, a clipping mask with my pattern, and then a clipping mask with the overlay layer. You make lots of clipping masks onto one element and you want to do this because with the duplication of the same element, they can sometimes get this outline and you don't want that. So make it a habit of clipping them all together! Next week I hope to get a tutorial to you about selectively recoloring an element, meaning elements with different colors. 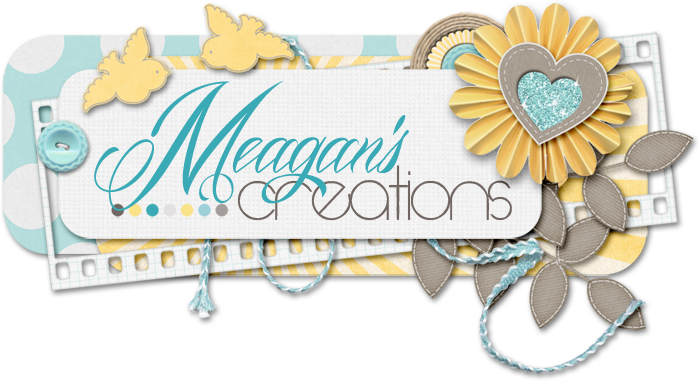 Till then, Happy Scrapping & Designing!